Traditional Polish folk art extends beyond the performing arts of music, song, and dance. We offer unique opportunities to our members to learn new crafts and skills, as yet another way of passing on our rich Polish culture. Each year, on the last Saturday before Palm Sunday, the hall under Holy Trinity Church becomes a “prairie” of sorts, filled with freshly cut branches, leaves, ferns and flowers. 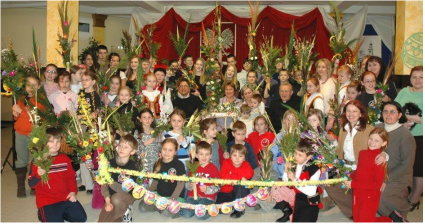 We craft traditional Easter Palms for our families and loved ones, which we bring to Palm Sunday Mass for ceremonies and blessings. Due to popular demand, we have recently begun selling our beautiful palms to Church members, with proceeds offsetting a portion of the Ensemble’s travel-related expenses. We also learn techniques for creating pisanki, or Easter eggs. Students draw patterns on the eggs using beeswax, then submerge the eggs in colorful dyes. Once dried, the beeswax is gently removed to reveal the layered patterns and designs. Another Lajkonik tradition is the crafting of beautiful holiday centerpieces, or "stroiki". We use fresh pine and other greens, along with decorative ornaments, bows and candles to create handmade, natural centerpieces for the holiday dinner table. This unique fundraiser is popular among Church members and the community, who enjoy purchasing and displaying the stroiki in their homes and giving them as Christmas gifts.